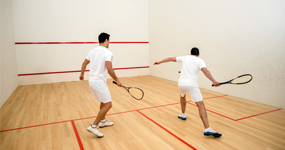 The Fitness Centre currently welcomes both WCP Tenants and the public to join as members and become a part of our squash community. Are you exercising for the right amount of time to reap the full rewards and health benefits of a fit lifestyle? We can help you get there. Our wellness services are designed to engage and motivate participants into taking charge of their own health and overall wellness. The Fitness Centre currently welcomes both WCP Tenants and the public to join as members. Please contact us at 403-662-2240 for more information. Dowload our NEW mobile app SEARCH for : "WCP FITNESS"
Meet our new personal trainers Timothy Licudine and Ryan Quinn!